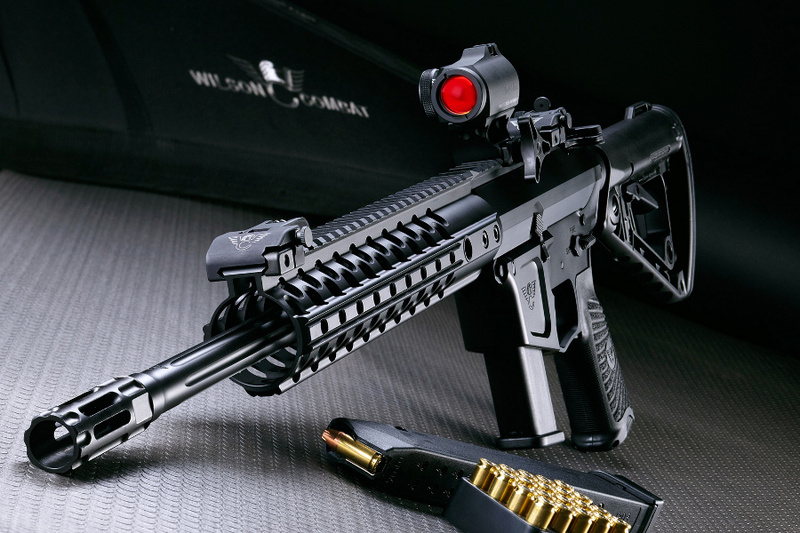 Wilson Combat is releasing their take on the pistol-caliber carbine, an AR-style design called the AR9. Like a handful of new AR-based carbines chambered for 9mm Luger, Wilson Combat’s AR9 accepts service pistol magazines. What makes it stand out is that Wilson Combat has developed three versions of AR9: one for use with Glock-compatible mags, another for Beretta-pattern mags and one that uses Smith & Wesson M&P mags. This makes the Wilson Combat AR9 the perfect companion to a huge number of popular 9mm service pistols. Extended magazines are available for Glock, Beretta and M&P pistols and the carbine accepts standard-capacity magazines in a heartbeat. Not only does this make it easy to stock up on magazines, in a real-world self-defense situation, it means a shooter can reload using the same magazines they keep loaded on their hip, console or nightstand. Wilson offers the three models in several configurations including a full-size carbine and a compact pistol with different barrel lengths available for each. These are serious firearms designed for personal protection and law enforcement use; the fact that they’re less expensive to practice and train with is an added bonus. Developed from the ground up the AR9 series is designed with durability in mind; blowback-operated ARs can be hard on receivers so the AR9 is overbuilt, based on their machined BILLet-AR 7075 aluminum design with a beefy buffer tower built to handle the direct force the lower will encounter. The lower receiver also features an integral oversized trigger guard and giant flared magwell to make reloading easy in even the most stressful of situations. The lower uses standard AR fire control group components and will lock back on empty, a feature some pistol-caliber carbines compromise on. The upper is also constructed from machined billet aluminum and designed to maximize accuracy. Standard or fluted barrels are the option. Wilson has a handful of barrel offerings ranging from 8 to 11.3 inches for their pistols and short-barreled rifles and 14.5 to 16 inches for their carbines. The barrels are Wilson’s match-grade and have a 1-in-10 twist for accuracy and stability across a wide range of ammunition weights. Other accessories include a Wilson Combat modular TRIM Rail with quick-detach sling swivel sockets, a custom Wilson Combat Bravo Company Manufacturing pistol grip, a 5/8×24 Q-Comp flash hider and either a Wilson/Rogers Super-Stoc or a Shockwave Blade pistol stabilizer. AR9 carbines and pistols use a proprietary Wilson Combat bolt with a large oversized claw extractor and oversized plunger ejector to ensure reliability with all ammo types. The AR9 was designed to shoot the full spectrum of ammo from cheap plinking and training ammunition to overpressure 9mm hollow point rounds. As usual, Wilson spares no expense with these carbines and pistols. These firearms start at $1,995, which is steep, but not out of line with the rest of Wilson’s premium offerings. 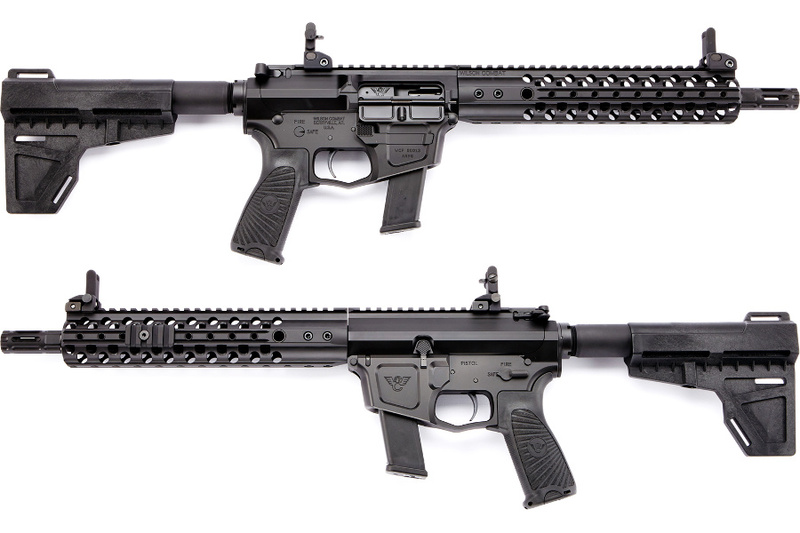 The Wilson Combat AR9 series also underscores the future of AR-style firearms. With the AR-15 market thoroughly saturated, more and more companies are getting in on the pistol-caliber carbine action, and as far as we’re concerned, that’s a very good thing. I have a norinco in 9mm that is my concealed carry weapon. It has fired thousands of rounds and dependible as high dollar pistols..it’s thin, light, single stack design is great. The guys at the gun club like to laugh at me carrying it until they meet me at the range and I score much higher than them. Laugh away. ..I only paid $189 for mine. I have a Pistol Caliber Carbine (Pistol 9.5 inch barrel) chambered in 357 Sig, built on a Quarter Circle 10 lower by Ron Williams Xtreme. It uses Direct Gas Impingement Operation, not blow back, so the recoil on it is as soft as a 10-22 rifle. It uses Glock 40 cal magazines. This is a great weapon easily hitting bulls eye at 100 yards without optical magnification. Best part of it all;…..It was half the cost Wilson. Ron Williams is famous for building ALL CALIBER’s of Direct Gas Impingemet Pistol Caliber Carbines, even the most exotic calibers like the 7.62×25. Contact him, he has been perfecting this for decades before it ever became popular and he is possible the most experienced PCC builder in the industry. Say what you will but i have a .40 cal hi point carbine that i would put up against any other pistol caliber carbine any day. I have less than $200 in it and have never once had any failures in the 1500 rounds I’ve sent downrange. The gun is cheaply made and extreemly FUGLY!, but i would trust that weapon with my life if i had to. The sights are the best feature and are better than any peep sight i have ever used. Hitting targets out to 100 yards is no problem but beyond that i would grab a rifle. I know everyone says they are garbage and going on appearances i see why but i have many other much more expensive guns that dont shoot half as well as this hi point carbine, plus its made in America. I would recomend this carbine highly to a new or young shooter to have some fun at the range with instead of paying ten times that amount for a pretty gun with a popular name that gives me the same end result. I find the Hi-Point 995TS to be rather attractive actually. That is what caught my eye, at first, and prompted me to research it. All the reviews I have read, and videos I have watched on that carbine were positive. No one mentioned anything bad about it, and in fact, praised it. After becoming an owner of the 995TS, I must concur with all the others: It is a great carbine, with great sights and excellent accuracy. It has been 100% reliable from the first round. It’s fun to shoot. It’s a great value. And it looks good too. I think I will stay with my old Ruger .44 Mag. carbine. When I shoot something with it, it goes down and stays down. Says the guy with the Sig MPX. As a guy with several guns from Wilson Combat I would say they are worth every penny. I would feel very confident buying one and knowing that it will RUN reliably out of the box and IF there was a problem they would bend over backwards to make it right. The attention to detail and doing everything “right” is what sets them apart. Wow, i really liked this weapon til the price was given. Sorry, just to expensive. I’m not one who believes you have to pay more to get more. There ate many weapons out there just add good and far less money. Let price, sell more. Keep price up, and you only make a few dollars. Thank you for a good review. That being sais, I have been looking for a good, functional, and reasonably priced pistol caliber carbine. I will keep looking. Just get a key tec sub 2000 it folds in half when not in use and it’s around $500. At $1995 base price? Have you lost your minds? I will patiently wait for Ruger to bring a more traditional offering out. Ruger did make pistol caliber carbines. The PC9 and PC40. I had a PC9 with an aperture sight. I liked it, and foolishly sold it. Shortly after that Ruger dropped the guns, probably for lack of sales. Ruger insists on using its own optics rails. Had they used M1913, I believe sales would have been better. Cool idea, very expensive. I will stick with my Kel Tec sub 2000 in Glock .40. I like the combination I have. How about a carbine in 7.62 x 25? The round would be a great crossover round, it is powerful, light and accurate. The .30 w/umph, tho not quite a .30×39 ~! Check out the ppsh41. Old Russian dependability and a quarter of the price of a wilson. Lol I was just about to say the same thing. I got the 7.5″ pistol and plan on trying a TAC con 3mr trigger on it. does wilson make any of their parts? they buy their barrels already rifled, they buy their uppers and lowers from somewhere else, their gas blocks are stamped YHM on the bottom…..
it seems all they do is engrave their name onto the parts they buy elsewhere and then double the price. Same as Salient Arms. Buddy of mine works for a gun manufacturer who makes their BCG. They just plaster their name to it and charge a couple grand..or more. I’m also looking for a 10mm carbine. I would definitely try to get an MP5 if I were going with a 9. I EDC a 10mm so I think it would be great for a carbine. No, I’m not getting a high point! Hen will the AR9 be available & what is the price range? Yawn. I want to see AR carbines in other calibers than just 9mm. How about .40 sw, 10 mm, and 45acp? The industry wants to create every possible version of ar’s, but skips these calibers. It has been done before, but not readily available as yet. Quarter Circle 10 makes lowers, uppers, bcg’s & barrels for the 10mm, 45acp & 40sw & 9mm w/ use of Glock magazines. Wow!… as in good, or Wow! as in that starting price is ridiculous. (High).